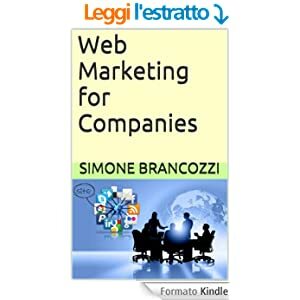 Vi presento Web Marketing for Companies, scaricabile ad un prezzo conveniente sul sito di Amazon. - Would you like to increase the visibility of your company, or the visibility of your customers? - Would you like to exploit all the advantages that web marketing can provide you? This is a guide for those unfamiliar with the web marketing, and want to start to explore the topic and to implement it in the first person, making less of consultants and experts, so if you are an expertician this guide may be expected. The idea behind all of what you read hereinafter is that the Web Marketing is a tool and, like any tool, it must be used knowing all aspects and possibilities in order to get the desired results. So, whether you think you know what Web Marketing is, not that you have any idea, read on and discover how it can help your business get unexpected results, even in a time of crisis like the one we are experiencing. In this regard I would like to point out one fact: this crisis, like all those that preceded it and all those that will inevitably follow the good that they have come to an end and give way to periods of growth, however, are the prerogative of those who during the crisis has been able to "hold on". Why get out of the current crisis in condition to start the harder you can and must, but only if you know how to do it. Here is, the Web Marketing provides you with the opportunity to exploit the crisis to your advantage: with the right investments and especially with the right mindset, you can achieve a competitive advantage over competitors who have not been able or willing to use this basic tool. You say: "I am a businessman, that what is the connection my products with computers? Why do I have to be present on the Web, if I work in homes and buildings? '. The Web Marketing offers a lot of opportunities, especially in terms of visibility. The Web is like a big square, where to find new contact or be contacted by other users. The Web is a great opportunity to find new customers and new partners for your business. Read the full ebook to discover everything about Web Marketing for Companies!